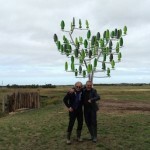 The Wind Tree – Innovative Silent Wind Power from France! I absolutely love this new invention! Designed by French company NewWind, The Wind Tree (Arbre à Vent) is an innovative concept to exploit the airflow passing through the urban or peri-urban areas thanks to its rotating leafs. The Wind Tree is a wind system whose leaves act like many mini wind turbines capable of providing power and energy autonomy. Clearly, it’s an artistic version of our traditional wind turbines. The major advantage of the Wind Tree is that it can be established everywhere, both in towns and in the country, in perfect harmony with its environment and it’s of course silent! By lowering the starting threshold for these ultralight turbines, 2 m /s wind speed instead of 3 or 4 m /s for conventional turbines equivalent power, it is possible to operate these trees wind up to 200 days year instead of the usual 100 to 110 days. The trunk steel carries a structure able to withstand raffals of strong wind. Two trunk sizes 8m and 12m are available in order to stay below the limit that requires a building permit (France). Micro -generated electricity is multiplied by as many leaves as a tree has to reach the required minimum power. From a base, anyone can compose the Wind Tree of his choice to get the power he wants, simply by reducing or increasing the number of leafs / turbines on the branches themselves removable. Its leaves are being clipped by a simple Plug & Play, one can intervene on a leaf without the rest of the production is stopped. For example; an 8 meters tree with branches including 100 leafs could produce up to 3.5 kWh of electricity, adequate for a household of 4 people. 3 Wind Trees can provide 10.5 kW, enough to recharge your electric car at home or at the parking lot of your business or your usual supermarket. These charging stations are essential to the development of using electric vehicles. The average unit price of the system is around 16,000 euros. NewWind has an international patent since October 2012. 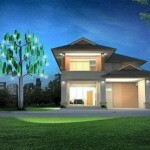 The Wind Tree is not only a simple innovation, it is also a beautiful and esthetic innovation! This renewable source is perfectly suited for the local authorities market. The world’s biggest home-furnishing retailer, IKEA, has announced it has struck a deal with a solar panel manufacturer to begin selling solar power kits from its stores in Britain. The Swedish company has revealed it has a deal with Hanergy Solar Group to sell the solar-panel systems in its 18 United Kingdom stores for the first time. At present, solar panel installations are already currently available from the IKEA Bristol store and they will sell the systems in all UK shops within 10 months after a successful trial that took place in July 2013. The Hong Kong solar panel producer Hanergy Solar UK have been chosen to offer a full solar installation service using next generation solar technology using thin-film panels. “In our opinion it’s the first time a truly global retailer has provided dedicated retail space and dedicated staff solely to PV.” says Toby Ferenczi, co-chief executive officer of Hanergy’s UK business. An IKEA solar panel would include the traditional in-store consult and design service, but there’s no attached instruction manual. The price also includes installation, maintenance, and energy monitoring after it’s installed. The installation of the solar panel system takes around 2 days. Once installed and tested and the Hanergy ‘Home energy monitoring system’ set up, the remaining costs can be paid to Hanergy then the costumer will receive all necessary paperwork to start receiving the Feed-in Tariff and earning from the solar system. IKEA has installed more than 300,000 solar panels on almost 300 IKEA stores and buildings across the world. As part of this commitment they have decided to make it easier for clients to purchase affordable solar panels for their home and could potentially earn up to £700 tax-free a year. Solar power is a part of IKEA’s plan to source all its energy from renewable energy by 2020. IKEA are strongly committed to investing in renewable energy and ‘energy-efficient’ technology to help tackle climate change and has committed €1.5 billion to invest up until 2015 (mainly in wind and solar power) to help them reach their goal of energy independence. The long term direction is for all IKEA Group buildings (warehouses, distribution centres, factories and offices) to be heated and cooled using renewable fuels such as wind, water, solar power, biofuels and geothermal energy. 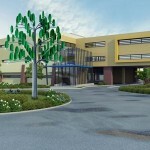 In addition, they will improve the IKEA Group’s overall energy efficiency by 25 percent compared with 2005. Among other things IKEA will use energy-saving light bulbs where possible, will have the lights on only when warehouses are open, and will install extra insulation to save on energy for heating and cooling. To find out more about buying solar panels from IKEA visit: www.ikea.com/gb/en/campaigns/solar-panels.html or click here to get advice from a Dorset Certified Solar Installer. Efficient transport of products; optimised loads and fewer transports – that’s why they design flat packs! Examples; One of their product designers found a way to pack the EKTORP sofa flatter and make the shipping box almost half the size.They redesigned the VIDJA lamp, making it easier to assemble by eliminating 24 of the 33 components which reduced the packaging weight by 28%, now they can fit 128 lamps on a pallet, where there were previously only 80 lamps! They use recyclable packaging requiring minimal raw material and by switching from wood to paper pallets they reduced their footprint of transporting IKEA products by 75,000 tonnes of CO2 per year. Using wood resources wisely; for many years they have worked with others to increase the supply of wood from responsibly managed forests and are one of the founding members of the Forest Stewardship Council® (FSC). Their IWAY Forestry Standard sets clear requirements for all wood used in IKEA products – which include a ban on wood that has been illegally harvested and from sources involved in forest-related social conflicts, or from high conservation value forests. In addition to suppliers meeting the IWAY Forestry Standard, the volume of wood from preferred sources (recycled wood and wood from forests certified by the FSC) increased to 22.6% from 16.2% in 2012. They are aiming for 50% by 2017. They now have 21 foresters specialists working to ensure that all wood is sourced in compliance with forestry standards and in a responsible way. IKEA partnership with WWF – projects around climate change; One of these projects looks at how to recycle IKEA products at the end of their life-cycle finding ways to enable customers to either recycle of re-use the products when they no longer want them. Another project will map all areas of the IKEA business where they can make a change to their current practices that will benefit the environment. They will also focus on creating awareness of IKEA products that can help people live a more sustainable life at home. One project is about minimising the carbon footprint of their food business. IKEA and WWF have worked together since 2002 to combat illegal logging and promote responsible timber trade, to support credible forest certification, and map and protect High Conservation Value Forests to secure biological and social forest values. So far they have helped to improve forest management in Europe and Asia, and contributed to increasing FSC-certified forest areas by around 30 million hectares in the countries where they work together. Working actively to prevent child labour; all IKEA suppliers and sub-contractors must comply with the IKEA code on conduct on child labour: “The IKEA Way on Preventing Child Labour”. That’s why IKEA Social Initiative invests in child rights projects with UNICEF and Save the Children. Expanding the range of organic products and food; Organic agriculture excludes the use of chemical fertilisers or pesticides, and strives to maintain biodiversity and ecological balances. Many markets are sourcing organic food for their national menu in the restaurants. For example IKEA Italy has around 70 organic ingredients used for restaurant food preparation. The Swedish Food Market in IKEA stores are also expanding range of organic products. Their global range offers 20 organic food products. Animal welfare; to improve the animal welfare standards in farms that supply to IKEA’s food business, IKEA has partnered with the international charity Compassion in World Farming (CIWF). CIWF engages with Europe’s biggest food manufacturers, supporting initiatives which lead to tangible benefits for the welfare of farm animals reared for food production. In addition, IKEA and all their salmon suppliers participate in the Salmon Dialogue, a multi-stakeholder initiative managed by the WWF which sets out principles and criteria for environmentally, socially and economically responsible salmon farming. Waste Management Manual; it was established for the IKEA group in 1999 requiring all stores to sort the five most common waste items, at a minimum. In practice, this ensures that almost 75% of the waste is sorted in the stores and more than 80% is (at the end of life) recycled or used for energy production. Food to Energy in Scandinavia; at some stores in Sweden, Norway and Denmark IKEA grind up food leftovers from their costumers plates in a mill and store them in a special tank. The food waste finds its way to a special treatment centre where it gets reused, as biogas to run buses on. "I will agree with Stuart’s comment above regarding the necessity of having a system installed by MCS registered companies. What he does not realise (or did not at the time) is that we only use local installation teams who are stringently monitored so as our customers are very well looked after. Although an international company working with Ikea to bring sustainable lifestyle at affordable prices, we understand the importance of keeping things local. Additionally, using local companies also keeps the costs down as they do not have to travel as far to install out CIGS Thin Film panels. I encourage the installation of all renewable energy; but for an initial quote that needs no home visit, please come and see myself or any of my team at the Bristol Ikea, or, of course, any other Ikea in the country where we have dedicated solar advisors present whenever the store is open. " "Whilst I am all for anything that raises the profile of Solar PV like this offer from Ikea I would strongly recommend anyone thinking of installing a system should talk to their local installer. Your Local Installer will be able to give you a much more personal service and at a competitive price that should be cheaper than the Ikea offering. You can find a full list of accredited installers at the following site http://www.microgenerationcertification.org/consumers/installer-search. As a small local installer we can offer a wide selection of modules and inverter types which are best suited to you and I am sure Ikea will be selling systems out of the box. "